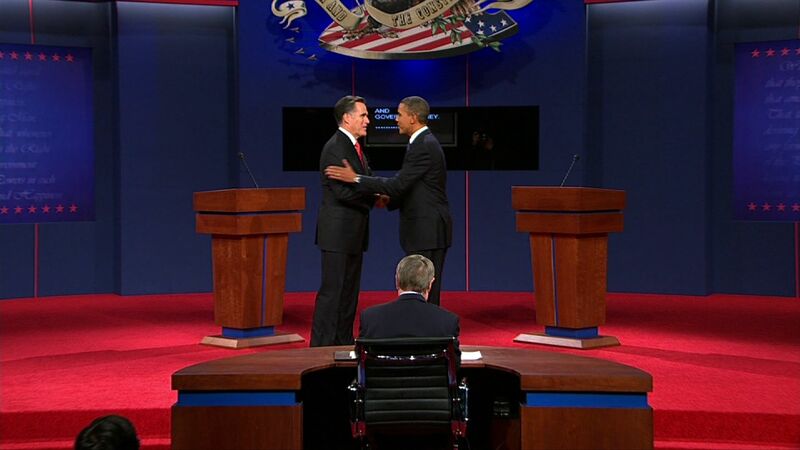 After months of heated, sometimes nasty, campaigning, President Obama and Mitt Romney met in the same room on the same stage for the first time Wednesday night for the first of three debates, this one focusing specifically on the top issue on voters' minds: the economy. At the University of Denver, in the battleground state of Colorado, moderator Jim Lehrer threw the first question to President Obama. Beyond the cordial, obligatory opening remarks, which included the president wishing his wife, Michelle, a happy 20th wedding anniversary and promising not to spend their next anniversary in front of "40 million people," the debate quickly turned to economic philosophy. The opening remarks of both candidates attempted to define the other but also outlined their differing visions. "Are we going to double-down on the top-down" economic plan that Romney proposes? the president asked, criticizing Romney for an economic plan that benefits the wealthy. "Or do we embrace a new economic patriotism?" he said, which he defined as an economic approach of shared sacrifice and a focus on the middle class. Romney responded recounting a story of a young couple who is struggling and just lost their home. He said he "can help" such families, but it's "going to take a different path." He added, "The president has a view very similar to the view he had when he ran four years, that a bigger government, spending more, taxing more, regulating more -- if you will, trickle-down government -- would work." Romney promised, if elected, to meet with Democrats on his first day as president to ensure he can get things done. The president, however, mocked Romney's statement. "I think Governor Romney's going to have a busy first day, because he's also going to repeal 'Obamacare,' which will not be very popular among Democrats as you're sitting down with them," he quipped. "And I've got to tell you, Governor Romney, when it comes to his own party during the course of this campaign, has not displayed that willingness to say no to some of the more extreme parts of his party," the president added. Prior to the start of the debate, an Obama campaign aide said the president's aim is not to attack Romney but to "correct Romney's attacks as needed," adding that his "number one goal" is to lay out his plans for the next four years. The president partially stuck to that goal. He didn't attack Romney personally (as Romney didn't take personal shots at the president), but he attempted to define Romney's proposals, especially around the issues of Medicare and taxes. The president, who appeared nervous at the beginning of the debate, hit a common theme he often addresses on the campaign trail, slamming Romney's tax plan for cutting taxes by $5 trillion dollars without defining how he would pay for it. "How we pay for that, reduce the deficit, and make the investments that we need to make, without dumping those costs onto middle-class Americans, I think is one of the central questions of this campaign," the president said. Romney quickly refuted the president's argument. "Virtually everything he just said about my tax plan is inaccurate," Romney said. He added that his plan would cut taxes for the middle class, but wouldn't reduce the "share" of taxes high-income earners pay. "High-income people are doing just fine in this economy. They'll do fine whether you're president or I am," Romney said. "I will not reduce the taxes paid by high-income Americans." Mr. Obama chided, "Well, for 18 months he's been running on this tax plan. And now, five weeks before the election, he's saying that his big, bold idea is, 'never mind.'" He also questioned Romney's mathematics saying, "[T]he fact is that if you are lowering the rates the way you described, Governor, then it is not possible to come up with enough deductions and loopholes that only affect high-income individuals to avoid either raising the deficit or burdening the middle class. It's -- it's math. It's arithmetic." After the president said Romney would cut education to pay for tax cuts, Romney responded, "Mr. President, you're entitled as the president to your own airplane and to your own house, but not to your own facts." Romney said "the right course" for the country is to not be the economy's referee, but make the private sector "more efficient and more effective." Turning to the issue of Medicare, Romney said definitively, "What I support is no change for current retirees and near-retirees to Medicare." Responding to Romney's insistence that his plan would not impact people currently on Medicare, the president turned to the camera and said, "If you're 54 or 55, you might want to listen because this will affect you." The president described Romney's plan as a voucher system that would cause seniors to pay more. Romney defended his proposal, saying it would offer seniors the choice of the government's Medicare program or insurance-run health coverage. He also said he would means-test Medicare benefits, which means high-income earners would receive lower benefits. Both candidates and their campaigns spent the days leading up to the debate trying to lower expectations, downplaying their debate-skills and insisting that they didn't need to "win." A CBS News instant poll shows that more viewers thought Romney did in fact win. Romney attempted to draw attention to one of the themes his advisers said he would hit: whether the last four years were good years. "Look at the evidence of the last four years. It's absolutely extraordinary. We've got 23 million people out of work or stopped looking for work in this country," Romney said, adding that 15 million more people are on food stamps and economic growth is slower. "The question here tonight is not where we've been, but where we're going," Mr. Obama said. Tonight's debate skewed from its format of six 15-minute segments, but the debate still covered the broad issues of the economy, health care, the role of government, and governing. Each candidate received two minutes to respond to each topic followed by a Lehrer-moderated discussion. In the debate section that focused on health care, the Affordable Care Act was the center of the discussion. Romney said he would replace the health care law because it adds to the cost of health care, cuts $716 billion from Medicare and put in place "an unelected board" to make health care decisions. "It's expensive and expensive things hurt families," Romney said. "We've seen the model work really well in Massachusetts," the president shot back, referring to the universal health care plan Romney signed as governor of Massachusetts. "It hasn't destroyed jobs," he added. "I like the way we did it in Massachusetts," Romney responded, insisting that each state should decide its own health care plan. "What we did in Massachusetts is a model for the nation, state by state." "Free enterprise is more effective of bringing down the cost," Romney said. "The right answer is not to have the federal government take over health care and start" issuing mandates. In response to the president's criticism that Romney has yet to describe how he would replace the health care law, the governor said his plan is "lengthy." He described two components that are part of his plan that were recently implemented through the president's health care law, including allowing people with pre-existing conditions and allowing young people to stay on their parents' insurance. "Going forward with the status quo is not going to cut it for the American people who are struggling today," Romney said. With the focus of the debate turning to the deficit, Romney charged that the president would "prefer" to raise taxes to lower the deficit. "I want to lower spending and encourage economic growth at the same time," he said. He said he would cut funding for PBS, move federal programs to the states and reduce the number of federal employees to reduce the budget. The president said he would cut spending by adding $1 of additional revenue to $2.50 of every budget cut. "If we're serious, we've got to take a balanced, responsible approach," Mr. Obama said. "There has to be revenue in addition to cuts. Now, Governor Romney has ruled out revenue. He's ruled out revenue." While both candidates spent most of the past several days off the campaign trail preparing for tonight's debate, they still have two more opportunities to meet. Romney and Mr. Obama will go head-to-head again on October 16 at Hofstra University in East Hempstead, N.Y., and on October 22 at Lynn University in Boca Raton, Fla. The vice presidential nominees, Vice President Joe Biden and GOP Rep. Paul Ryan, square off in their first and only debate next Thursday, October 11 at Centre College in Danville, Ky.